A Whitby campaign group is taking legal action against Scarborough Council to secure millions of pounds to carry out urgent repair work to the town’s harbour. It is hoping to secure more than £4 million to match-fund a Defra grant to repair the piers, which a 2007 report said may not last another 10 years. Town councillor John Freeman, who is part of the group, said the group’s case hinges on a piece of legislation from 1905. He said: “The Whitby Urban District Council Act of 1905 said that all revenue raised from harbours should be used to make improvements to the harbour. “However, Scarborough Council has been using the excess income to swell the coffers of its general fund. He said a letter of intent had already been sent to the council and the group was now looking to raise £50,000 to commence with the case. “The important thing to remember is that we would not have been forced into this action if the borough council had just held a proper consultation and got round a table and come up with a way for the Tourist Information Centre to remain open,” he added. “The council has had an offer from Defra sat on the table of just over £4 million to save the piers but it has so far not come up with the match funding. “It did, however, find a £9 million loan to build a new water park in Scarborough. “You have to ask yourself what is more important? 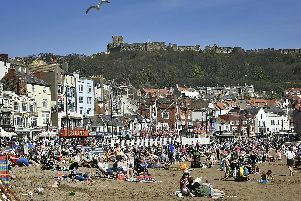 A new water park for people in Scarborough or to save the piers of Whitby which, if they fail, would lead to catastrophic flooding in the town? Scarborough Council declined to comment on the specifics of the legal action. Lisa Dixon, a Scarborough Council director, said: “We can confirm that we are in private correspondence with the legal representative of Whitby and District Tourism Association and the Fight4Whitby group about their claims.